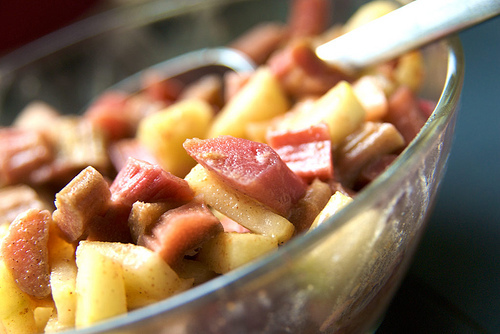 Almost good for you: Rhubarb and Apple Crisp | Bad Human! Don't take chemicals from strangers! I feel it unfair that anything like an apple crisp has been labeled a “dessert”. After all, apples are good for you, right? And when you add a vegetable, you really can’t call it a dessert. Can you? OK, I’ll admit that crisps are probably not something that you’d want to give your kids for breakfast, if for no other reason than they’d come to expect it. So in the spirit of the food classification party-line, we’ll go ahead and call a crisp… and a not health food. But they are good! I (J.) hadn’t had a crisp in a long time, and I hadn’t had rhubarb in so long that I forgot what it tasted like. By it self, it tastes (to me) like a bitter sweaty sock that I found at the bottom of one of my old Army duffle bags. However, when paired with some tasty golden delicious apples and a good portion of sugar, it flexes its versatile vegetable muscles. It really did surprise me. This recipe is (to me) a pretty standard crisp get-up. We got the idea from an older Bon Appetit recipe. We don’t really like walnuts, so we nixed those. And we just got a new cast iron skillet, so I decided to toss it in there and cook it. It came out great, and was super-easy. I think that we added more apples. But I was OK with that. And I’m pretty sure that we didn’t quite have 3/4 lbs of rhubarb. We had three pretty good-sized rhubarb stalk things, and that worked out great; just the perfect amount a crazy tartness. My old housemate and I used to eat apple crumble for breakfast, which is pretty much the same dish. She argued that the prescence of oats made it pretty much museli (granola). We agreed that this was only true if you ate it with yoghurt instead of cream. Rhubarb is popular in Sweden, so popular in fact that it magically appears in every garden or allotment with or without the owner’s approval. It’s as if they are in our genes. In general people just make crisps or lemonade out of it. I have to admit I’m not a big friend, but I inherited some with my new allotment (see!) so I think I’ll try your recipe this weekend. I made rhubarb sauce this past weekend and you were right…it does smell like a sweaty sock. After cooking with sugar it does smell tasty though.